NDX still looks like the bears' best hope at the moment... but -- and sometimes I assume this type of thing goes without saying -- I would advise only fantastic entries if one is bearishly inclined. Bears need to realize that the trend is still up, and has been for a long time, so they are (obviously) trading against the prevailing trend -- and countertrend traders do NOT get the benefit of recovering from marginal entries. 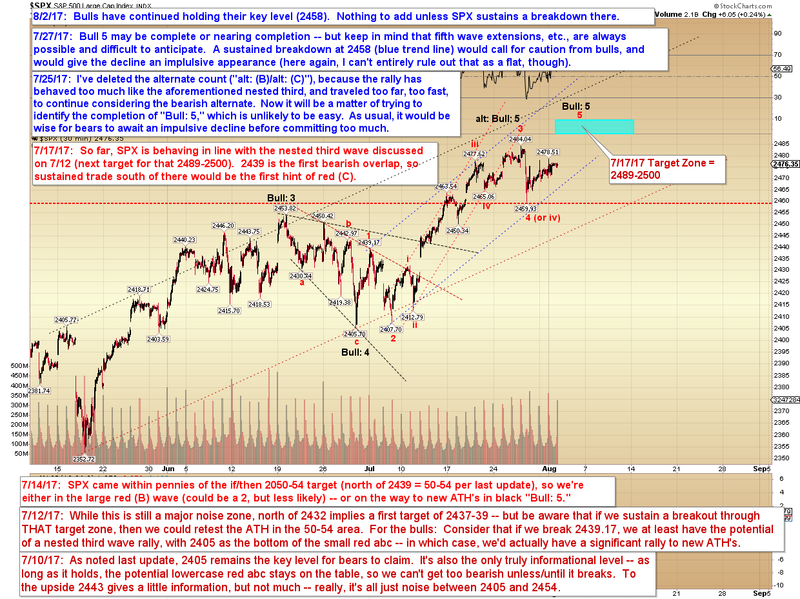 When one is trading with the trend, the market will eventually bail out every entry, no matter how bad -- but this is not the case for a countertrend trader. Countertrend traders can be left stranded for weeks, months, years... or even forever (if anyone is dumb and/or stubborn enough to hold a losing position through that level of drawdown, anyway). Keep all that in mind whenever we talk about bear options. Until we actually enter a bona-fide bear market, bears have to stay twice as smart, twice as nimble, and twice as discerning about their entries as bulls. 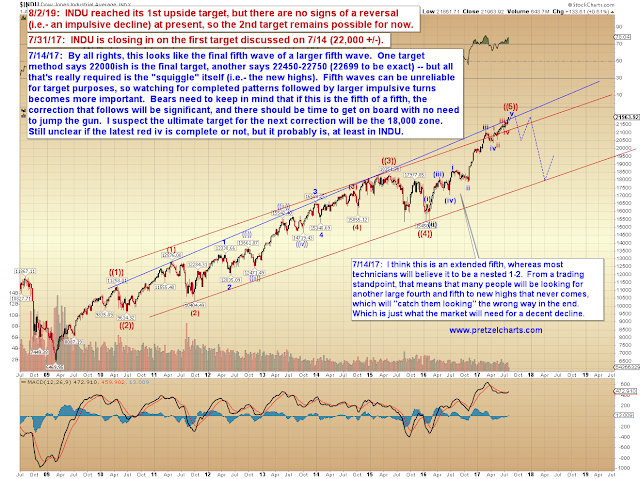 For an example of what I'm talking about, look at the SPX chart above. Back in June, somebody was buying at 2453. That was a horrible entry, and the market immediately reversed lower. If they were decent traders, they probably wouldn't have been buying that level in the first place, so we'll assume they were stubborn enough to continue holding through 50 points of drawdown. Nevertheless, despite their awful entry and their ill-advised stubborn approach, because they were trading with the trend, the market eventually rallied back up past their entry and bailed them out with a profit. 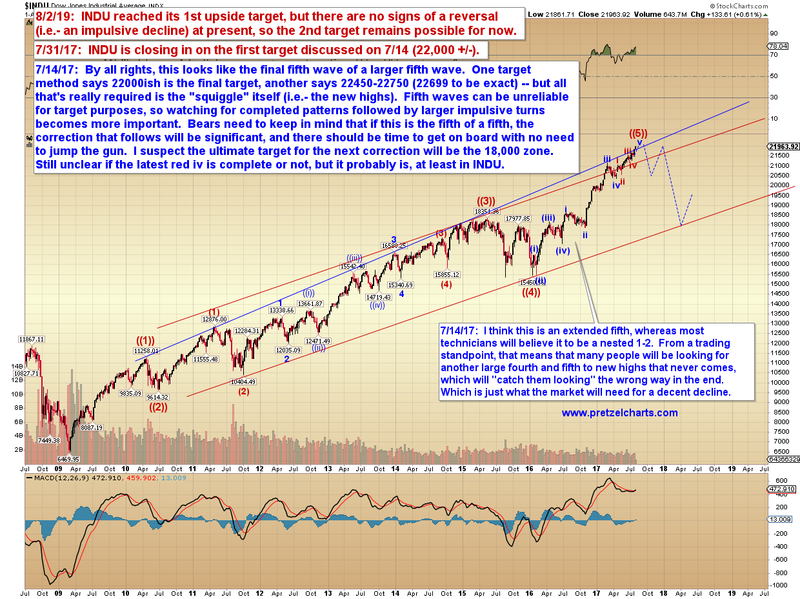 Eventually, that will change, and bulls will be punished for such actions. There's a reason for the old adage: "Don't confuse brains with a bull market." But, really, that's not any of our concern -- our concern is protecting and growing our own capital, not wasting energy being bitter toward bad traders who may be profiting despite themselves. So, all that should matter to us is our own actions, and our own awareness of what's smart for our accounts. And it's smart to know the prevailing trend, and thus know whether you have a wide margin of error, or a very narrow margin of error -- and then to behave accordingly. 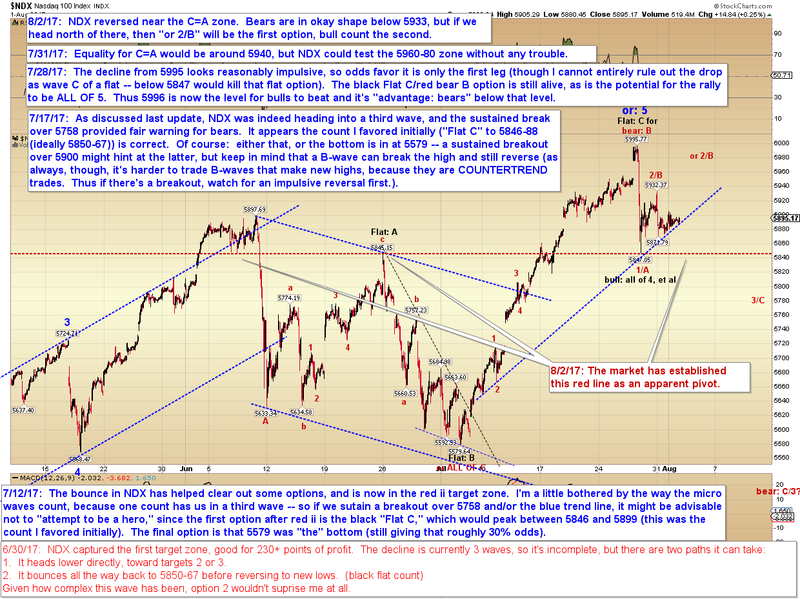 In conclusion, INDU has captured T1 and may be heading toward T2. 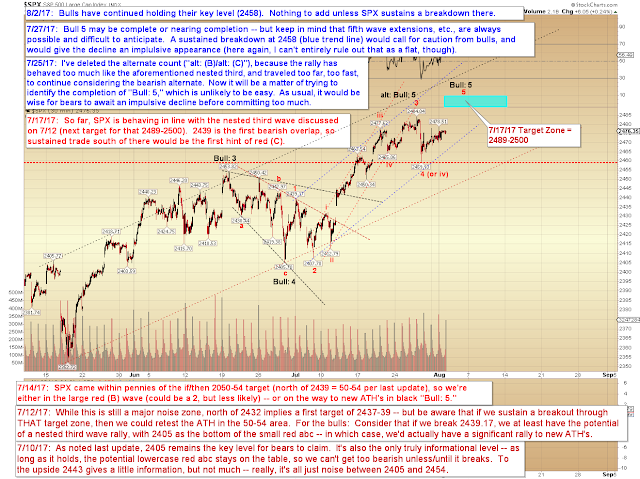 SPX has held the key bull level so far. 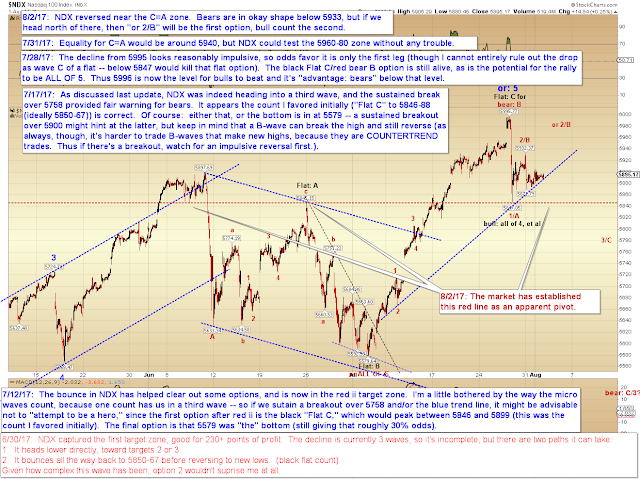 NDX looks like a market where bears may get a chance, but if it sustains a break over the 5933 level, then bears are probably best off waiting for a much better entry, in which case (in the event of a sustained breakout) that chance may come near the "or 2/B" level. Trade safe.